Who’s Buddy and why does everybody know him? 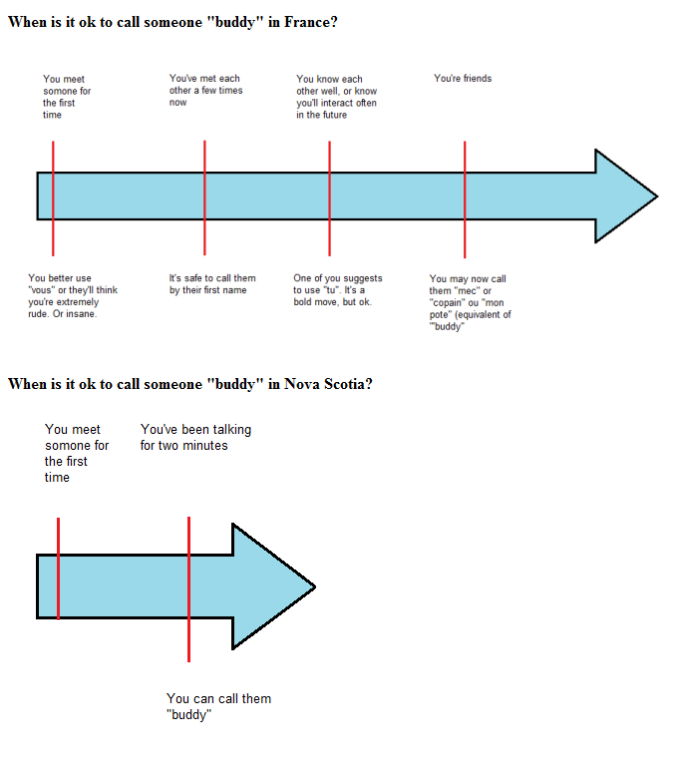 I have been living in Nova Scotia for a while now and I think I am well adapted. However, there are still a couple of things that I am not used to; “Buddy” is one of them. If you are not from around here, you might wonder who Buddy is. At least I did when I first moved here. People here use “buddy” in two different ways. The first one, the one I kind of knew about before getting here, is the equivalent of “friend”, as in “He and I are buddies”. However, I hadn’t realized you could call someone “buddy” whether or not you knew them. I come from France – a country that some might consider a little snobby – where people who don’t know each other wouldn’t dare not use “vous” [the formal form of “you”]. That’s why the first time a friendly barista gave me my coffee and said “here you go buddy”, I got very … puzzled. Had I forgotten that we were friends? Did I know him? Had I ever interacted with him? Don’t get me wrong, I wasn’t insulted or anything; I was genuinely confused because I wasn’t used to it. And there is a little part of me, that snobby French part I guess, that still cringes when someone I don’t know calls me “buddy”. – I couldn’t find Buddy’s office. – Steve, Buddy that takes care of the machine. That’s when it clicked. Buddy is nobody. Actually Buddy is everybody. And everybody knows Buddy. Buddy knows Nova Scotia very well. Do you? Take this quiz and find out.